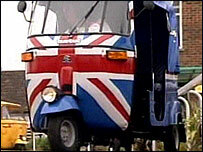 Twelve motorised rickshaws that were launched in the Sussex city of Brighton and Hove two years ago are to be taken off the roads for good. TucTuc Ltd director Dominic Ponniah said they had become impossible to run due to "archaic legislation". He said the system where the tuk-tuks had to run to a timetable had proved to be too rigid for the company. "We have decided to resign our licence as the current situation is just not workable," he said. "We have really pushed for new legislation to be put in place to accommodate alternative types of vehicles." He added: "There is obviously a market for them, but they can't be licensed in the appropriate way." The company appeared before the South East Traffic Commissioner in November 2006 and was fined £8,000 for not keeping to its timetable and operating the tuk-tuks like taxis. Mr Ponniah said the company would resign its licence when it faced a second public inquiry on Tuesday. The inquiry is to decide whether the firm breached its conditions last year when it stopped running the service without giving the necessary 56 days notice. He added that the fleet of colourful rickshaws, each painted differently, had been "loved" by the public and used by thousands of passengers since the service was launched in July 2006.